This is David, the new boot camp instructor working with Kerry and Vast Fitness. I wanted to thank you all for coming to my first running session last night. You all truly did a great job! You maintained your focus, your motivation, and, best of all, your breath. Improving your breath, your form, and your speed will all come in time. The more you practice, the easier it becomes to enjoy running and your own progress. Starting from small, achievable goals of completing 1 lap around the track or concentrating on your breath for 10 minutes will set you up to conquer bigger goals of running all 2.8 miles of Green Lake or all 26.2 miles of a marathon. These small goals will be the primary focus of our running clinics on Tuesday nights. Last night’s session focused on some basics of running: 1) breathing 2) form and 3) speed. Emily, Lisa, and Rik, you all did a phenomenal job concentrating on your breath! This will be the foundation that we build upon throughout these running clinics. During the course of the next 2 to 3 months, we’ll touch more on these techniques and other related running topics. I’ll address stride and strikes more thoroughly next week, along with breathing and more form and speed work techniques. Go for a jog or two this week and solely concentrate on your breath. Slow, deep sips of breath in through the nose and pushing the breath out through the mouth. When you catch yourself gasping, stop for a moment to regain focus. Remind yourself that your energy should be powering your legs and not the gasping of air. Breathe deeper to create more of an effortless jog. Concentrating on these techniques will have you ready to run 5 miles straight by the end of the summer, I promise! Also, I am new to instructing boot camps and running. I’m well trained as a cycling instructor and have a collegiate background in cross country running. 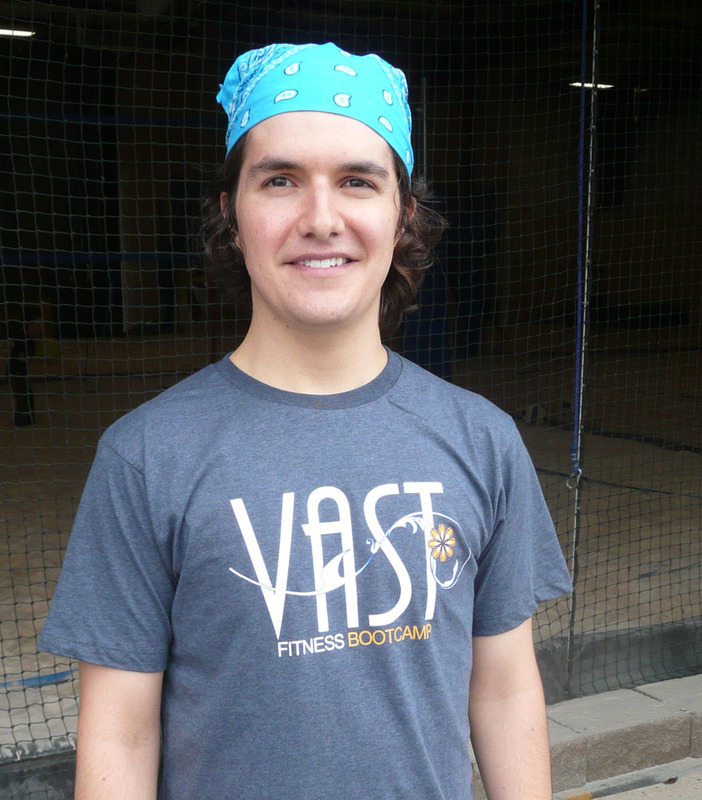 I’m committed to providing you with a great, sweat-worthy, yet informative experience here at Vast Fitness, so any feedback that you have about my performance and instructing style is appreciated and useful. Not only will it help me as an instructor, but it will also better your experience in boot camps and the running clinics. You can direct any questions, suggestions, or concerns my way or Kerry’s. I will do my best to implement all suggestions into my instructing and answer questions to the best of my ability. In addition to wanting your feedback about my performance as an instructor, I also would like feedback about your performance. What are some of your fitness goals? What do you like and hate about exercising? (i.e. Do you like squats? Do you hate running?) Where would you like to improve? And what are some of your small and big goals regarding your health and fitness? Do you want to conquer a run around the lake, do 30 repetitions of Hindu push-ups, or complete a triathlon? Put me in the know if you haven’t already! Thanks for all your effort. It’s truly inspirational. See you all soon!